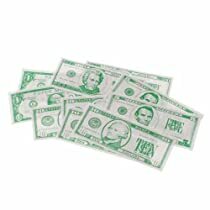 Use this fake money for poker games, pretend play, or replacements for worn out money in your board games. There are 10 bills per package. Made of paper. Size 6″ L. Printed on both sides.